[FYI] The king of Mysore, Krishna Raja Wodeyar IV and Sir MV were in a pensive mood. They had reached a dead-end. The king of Mysore, Krishna Raja Wodeyar IV and Sir MV were in a pensive mood. They had reached a dead-end. The proposed KRS dam was 6 months away from completion and they had run out of money. Just 8 months ago, the king had mortgaged his family jewels to king of Benaras (now called Varanasi – the oldest inhabited city in the world). The queen has given her favourite necklaces and family heirlooms for the project. But eventually, that too ran out in mounting labour and construction costs. According to human psyche, they say, when we are cornered and have nowhere to go, a sudden and unexpected courage takes over our very being. A man thus subjected will pull off all odds in a sortie mainly because he has nothing to lose. Sir MV had an impractical idea, but wanted to attempt. That morning, he sent out messages to all village headmen that he wanted to meet them in a village near Mandya the next day at 4 pm. The royal messengers rushed out to village after village delivering the important missive. The agenda was not mentioned. Sir MV expected at the most 5 to 10 village headmen would come to the meeting due to short notice. Next day, they reached the meeting at 3:50 pm. There were more than 500 people, village elders and younger crowd included. All wanted to hear the great engineer who was building this huge lifeline. There was another man walking with Sir MV. The crowd gasped. For most of them had never seen the king up so close. The king was a genteel, but education had taught him humility. He walked amongst the crowd, spoke to them as a commoner, mingled and finally took up the stage. He spoke. From the heart. In their language. He did not hide anything. He said that he needed help. And asked the villagers if they would work for free for 4 weeks until he found out a solution. He told them that he was thinking of mortgaging one of palaces. Here was a king who was like them, without money and was about to mortgage his house. “Just like us” they thought. But what touched them most were his vulnerability and simplicity. The king had connected. The effect was electrifying. However, no one responded. A month of free work meant depleted savings for some, and for others, starvation. Next morning at 6:30 am Sir MV met the king and they commenced discussing mortgaging the palace when the king’s secretary suddenly rushed inside. He exclaimed “You got to see this.” Everyone hurriedly went to the palace balcony. The sight was one to behold. 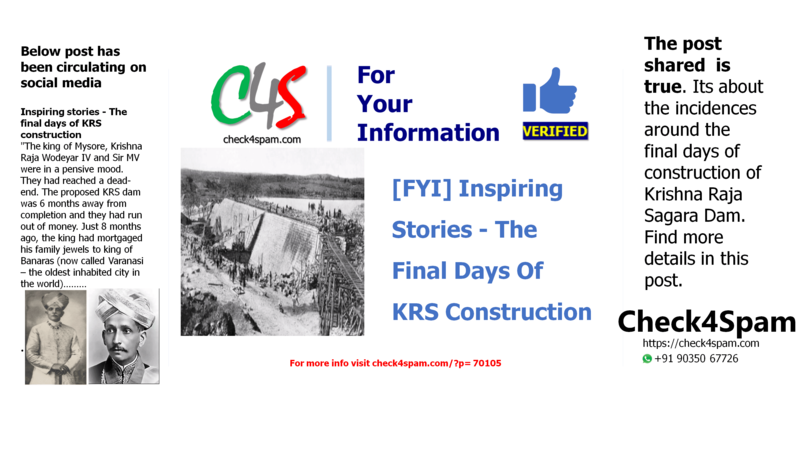 Verification: Yes this is a true story about the King of Mysore and the construction of KRS Dam. “The king of Mysore, Krishna Raja Wodeyar IV and Sir MV were in a pensive mood. They had reached a dead-end. Above mentioned lines are excerpt from the Kannada Book called “Mokshagundam”Life history of Sir M Vishweshwaraiah. This book is written in Kannada language. It is available in book stalls. This article is shared by Mr Srinivas Krishnappa on his Linkedin account. Mr Srinivas Krishnappa is a writer, and shares lot of interesting stories on his account. We talked to him about this story and he told us that this is an excerpt from the book called “Mokshagundam” that is written in kannada, the biography of Sir M Vishweshwaraiah. He even had conversation with the people of Mandya who told him how their ancestors were involved in construction and the stories about the final days of KRS construction Krishna Raja Sagara (KRS) dam is true. Most of the houses in the Cauvery belt have pictures of the King and Sir MV. At the time of the construction, middle class could not afford photos of construction as one black and white photo costed Rupees 3. Yet every family cherish the memories of that time and share the stories with their next generation. The Bharat Ratna awardee, Sir M Vishweshwaraiah was born on September 15, 1861 in a village called Muddenahalli in Karnataka. National Engineers’s day is celebrated on Sir M Vishweshwaraiah Birthday. 1884 – 3 August 1940) was the twenty-fourth maharaja of the Kingdom of Mysore, from 1894 until his death in 1940. At the time of his death, he was one of the world’s wealthiest men. Read More about the king Krishnaraja Wadiyar. Mysore is a beautiful place with lots of history and stories associated to it. Dussehra festival is the main attraction of Mysore city. There is an ornamental garden attached to this dam called Brindavan Gardens.The most beautiful garden.